("Maui", in many Polynesian dialects, I believe means "the first one". Leg #1:  183.5 & 4th in class -- My first AKC Show! 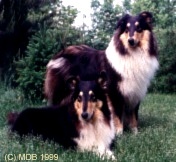 On May 19,1990, Mauii whelped her 2nd litter by Show Down Kaiser -- "Kaiser"
2nd -- Brace Obedience with his dam, "Mauii"
I went to college in September of 1989 and didn't graduate until May 1993. Yet, with minimal time to train, mostly weekends, which I would drive home (two hours to and from college) to work with them, both Mauii and Wolfie completed titles with very respectable scores. In 1991, I started the Purdue University Dog Training Club with other charter members including Michelle Redfern who is now a practicing DVM and avid exhibitor of Old English Sheepdogs. I have moved with my job 4 times now in the last 7 years. First from college in Indiana to a rental house in New Jersey (93-94). Then from NJ to Tennessee (94-98). Then from TN to Columbus, OH (98-2000), and now we are moving again to the Cleveland Area in Ohio (2001-?? and hopefully for the last time for a long while). 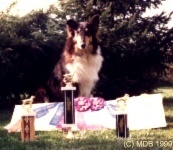 Even with all the cost and confusion of the moves (which cuts seriously into my show budget and training time)the LegendHold Collies continue to finish titles in spite of it all. Sure, I'd like higher scores and more placements, but what can you expect from only 4 to 5 serious training sessions before I just go and enter them in the trials and going for the titles? I can find no truer testament to their character, intelligence and natural abilities then that. NO He's NOT a Border Collie..
Mauii was undoubtedly the most intelligent dog I have ever had the pleasure of knowing. She could learn anything from the simplest "sit" or "down" to pushing the handicap door buttons on the buildings at Purdue to let herself in. She could perform multiple commands in the order she had been told and could always show visitors "her ribbons" wherever I would move them too. She taught me as much as I taught her. She had a presence that told you "this is a collie". Wolfie was one of those dogs that when you looked into his eyes, you saw his soul. If you ever questioned whether or not animals have souls, you would have no further questions after meeting him. Wolfie finished his last leg on his PT title on June 21, 1998. Even being ill with cancer (and I truly did not know how ill he really was at this point) he completed a rather slow but excellent run, waging his tail the whole time. He had the heart of a true hero and a true collie. He collapsed the day after he finished his PT title of a very rare form of cancer... myxosarcoma. 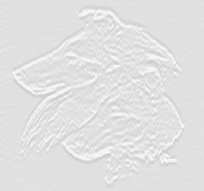 See Wolfie's page for his tribute. 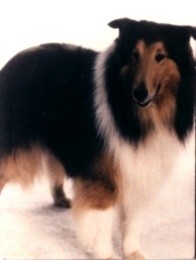 "Wolfie" was the essence of a true collie in heart and spirit. His temperament and courage still goes unequaled here at LegendHold. "I pity not those who have never owned a dog such as you, I pity those that do." 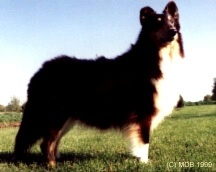 This website is dedicated to the collies that will carry on the story of the LegendHold Collies. I can only hope my feebile efforts to publish their stories, provide insight, provide links to other informative sites, and share a little bit about my breeding and training philosophies, will help educate those who would venture to be owned by the COLLIE. These are the friendly folk whose god I am. They crave but leave to follow and obey. What, but a dog, would serve such gods as we? Or doubt the godhead of their master, Man. For injury or for injustice hard. To travel through their hour of lifetime here. Millennium must dawn within the year. Because each of the LegendHold Collies are special individuals, they have their own individual pages. Some pages take time to down load due to pictures, theme songs, and maybe even a video clip, so please take the time to explore these pages so you understand the effort that goes behind making a LegendHold Collie a true COLLIE!